We took about a month off from working on our bathroom remodel to focus our attention on outdoor projects, mainly the secret garden patio area. That’s all finished, so we turned our attention back to the bathroom and we’re almost done. Just a little bit of painting and primping remains. I use the term “we,” even though I mean my husband. He really is the one who’s done almost all of the work. I pretty much just get to do the fun stuff like deciding what I want done and decorating. 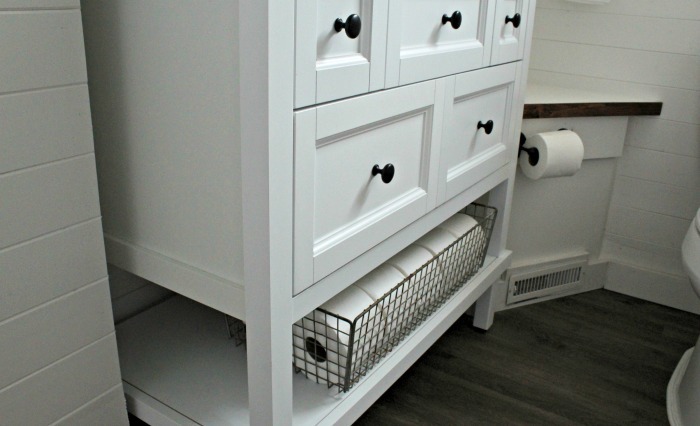 If you recall when I shared my plans for the remodel, I wanted to buy a beautiful wooden vanity, but after buying all the wood for the walls, paint, a new bathtub, a new toilet seat, and plumbing supplies, my budget was tapped out! 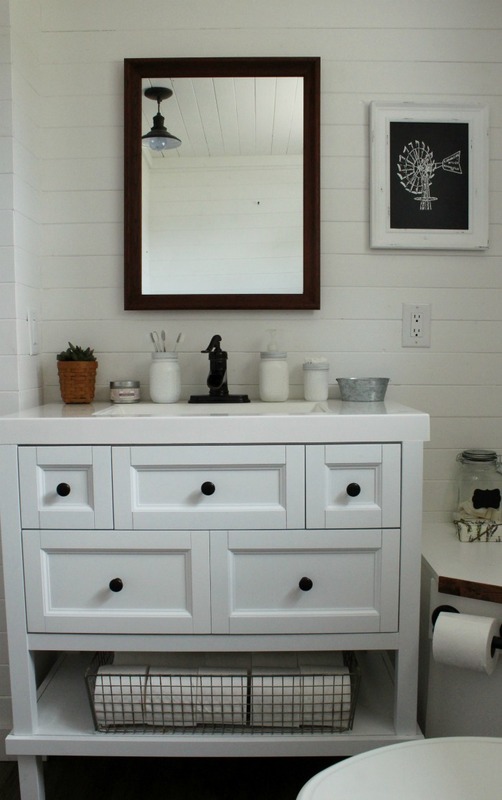 I started shopping locally for a new vanity and finally found one that I liked. 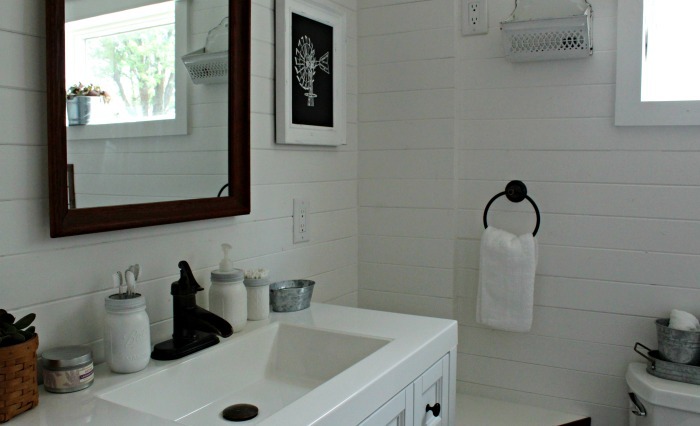 I chose a white vanity because it was the right size to fit where the old vanity had been and it included the basin. Our old vanity lacked drawers and the new one has quite a few of them. Best of all, it was easier on the budget. The knobs were originally silver, but my husband spray-painted them rubbed oil bronze to match the other fixtures. We used the same faucet we had on our old vanity and just removed the hard water marks by soaking it in vinegar. I added a new hand towel ring on the wall and a towel bar on another wall, which you can’t see in this photo. 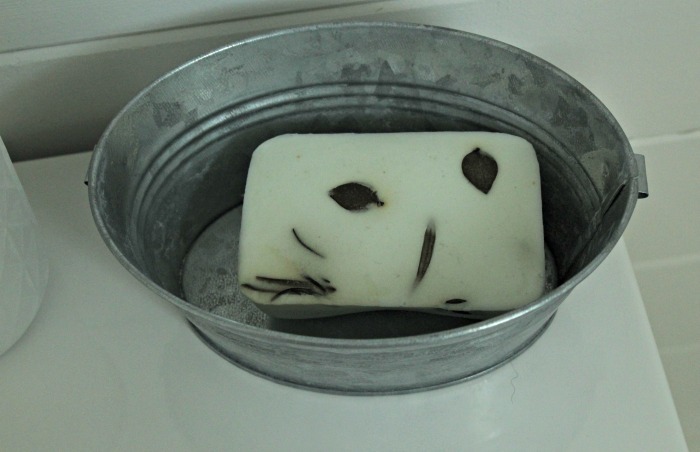 I put a bar of my Rosemary and Eucalyptus handmade soap in a mini galvanized tub that I bought at Hobby Lobby. I bought the wire basket at an shop in an old school when my husband and I went on our anniversary shopping trip to St Louis. We chose vinyl faux wood plank flooring, which I love. It has grooves, which replicates real wood plank flooring. By the way, I’ll have the full resource list for all the projects my husband and I made, as well as the products we bought, when I show the full reveal that is coming soon! The vanity looks terrific! I love the ones that come with the solid countertop and basin, it means no trying to clean around the grout around the sink. 🙂 I also love that faucet…it is my dream faucet. 🙂 Kudos to your hubby for all that hard work and the decorating looks beautiful! That’s what I love also Claudine. my last sink was a beast to keep clean around the edges. That turned out so beautifully, Angie! Lovely bathroom!